is an intermediate spiral galaxy about 11,000,000 light years distant, and approximately 70,000 ly across. 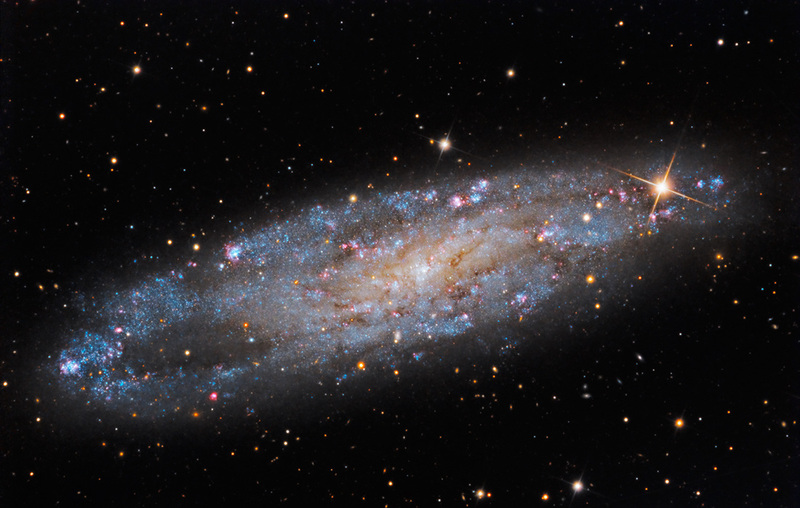 NGC 247 is nicknamed the Needle’s Eye due to the relatively vacant void that appears at left, roughly 8 o'clock on the disk. This nearly edge-on galaxy has loose, ragged arms that contain many pink HII knots, indicating active star forming regions. The Needle's Eye Galaxy is a member of the Sculptor Group- an assembly of thirteen island universes, including the Silver Coin Galaxy. This data from 2010 and 2013, is the third I have processed from the SSRO archive.